Fonolo’s approach to improving the call center is radically different from anything you’ve seen before. Rather than asking you to install new hardware or software, Fonolo integrates with the call flow by bridging every call between your agents and your customer. With Fonolo’s Hold-for-Me feature, you can show your customers that you respect their time and offer to call them back when an agent is free. This approach to virtual queuing can eliminate hold time for your customers in a way that is completely transparent to your existing infrastructure. 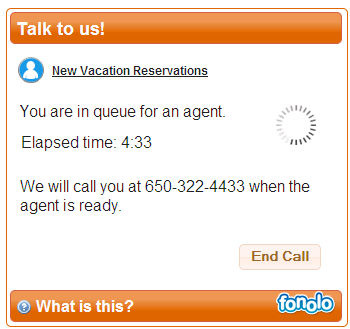 To your call center, calls through Fonolo look like any other inbound call. Your IVR, ACD, CTI and other systems will continue to work exactly as before. Create an improved customer experience. Reduce operational costs and improve agent efficiency. Provide a uniform interface between the web and mobile applications. Collect information from customers before the call to streamline the agent conversation. Visit the Fonolo Resources page to download the full Whitepaper on Virtual Queuing. This entry was posted in Fonolo and tagged fonolo, virtual queuing on 2011/07/25 by mike. Why are your customers still waiting on hold? Waiting on hold is consistently one of the top complaints about phone-based customer service. One way to eliminate hold time is to hire enough agents that one is always available. Of course, this is cost prohibitive for most companies! Another way is to implement a virtual queuing (VQ) solution. Is the secret to virtual queuing in the cloud? When will we stop waiting on hold? There are some great cost-savings arguments that support the case for VQ. (I’ve been spending a lot of time working through these scenarios with prospective customers.) But I believe the best case for it is the uplift in customer satisfaction. In today’s hyper-connected world, delivering a superior experience to your customer is something that echoes quickly and has long-lasting impact. I just came across this quote that sums it up nicely. This entry was posted in Fonolo and tagged fonolo, virtual queuing on 2011/06/22 by mike.